12TH DECEMBER, 2002 AT 11AM. MR. COUGHLAN: Now, Sir, I finished yesterday by making reference to a debate in the Dail on the 30th April, 1996, and I said I would return to it. 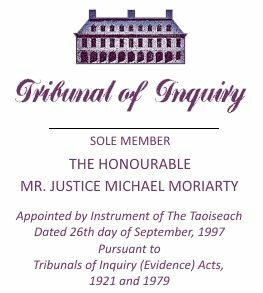 There was also a debate in the Dail on the 16th April, 1996, and they appear to be the two occasions other than question time on the 22nd November, 1995, when the question of the GSM licensing process was considered in Dail Eireann from the information which is available to the Tribunal, it appears that the content of the debate in the House on the 16th April, 1996, and 30th April, 1996, was well informed, particularly on the part of the then opposition. And I intend opening both of the reports of the Dail for both of those days for the assistance of potential witnesses, particularly departmental witnesses, Sir. But before I do that, I should perhaps just make reference to something I passed over slightly yesterday when we dealt with a fax which Ms. Regina Finn of the regulatory side of the Department sent to Mr. Martin Brennan and Mr. Fintan Towey on the 16th April, 1995, wherein she made reference to information which had just been given to her by Mr. Owen O’Connell, Esat Digifone’s solicitor. And attached to the fax which she sent to Mr. Brennan and Mr. Towey was a document or a note, and on the top of that document there was a graphic. And it shows Esat Telecom Holdings with a number of bubbles out of it giving information about the shareholding in that company and then that company owned 100 percent of Esat Telecommunications Limited, and then it showed an arrow pointing down to Esat Digifone Limited, 37.5%, and then on the left, Telenor Invest 37.5% into Esat Digifone, and then on the right, institutional investors IIU (Dermot Desmond) 20% plus 5% into Esat Digifone. Now, that document existed in the Department on the 16th April, 1996. And then if you just go to the text of the document and the very bottom it has, you see there is a reference to the Esat Telecom or Esat Holdings 37.5%, and then there is reference to Telenor having 37.5% of Esat Digifone Limited and then IIU (a Dermot Desmond company) currently holding 20% of Esat Digifone, which it intends placing with institutional investors. It also has the right to acquire a further 5% by means of the 12 percent of Esat Telecom Holdings Limited which is held by “Miscellaneous.” That appears to be erroneous in its interpretation. But it does appear that as of the 16th April, 1996, the Department had knowledge that the shareholding in Esat Digifone Limited was 37.5% as to Esat Telecom Holdings, 37.5% as to Telenor and 25% as to IIU/Dermot Desmond. Then, of course, I referred to the letter from Mr. O’Connell where he wrote to the Department the next day and made reference to the “25% of Esat Digifone Limited held by IIU Nominees Limited” and what he said it effectively represented. Now, I am going to read to report in the Dail on the 16th April, 1996, dealing with this issue. “AN CEANN COMHAIRLE: Deputy Molloy gave notice that he wished to ask the Minister for Transport, Energy and Communications if the reason for the delay in signing the GSM licence for Esat Digifone relates to concerns expressed by other applicants about circumstances surrounding the awarding of this licence. I understand the deputy wishes to share time. “MR. MOLLOY: Yes, with Deputy O’Rourke. The matter I tabled for this debate continues: particularly in relation to US corporations’ continued interest in investing in the Irish economy and if he will give details of representations made in this matter by the US Government, US corporations and the IDA, and if he will make a statement on the matter. That was the full text of my question. “The awarding of Ireland’s second mobile telephone licence is a bizarre affair. At the time of the award the Irish public and my own party welcomed the success of the seeming Irish consortium which was named as the successful tenderer. However, it has since transpired that the entire process which resulted in this decision is being shrouded in secrecy to conceal the fact that the Government has sold the family silver at bargain-basement prices in this case. It is now commonly accepted that the market value of this licence would have been worth £50 million to £110 million had free market forces been allowed to operate. Instead, the Minister for Transport, Energy and Communications, Deputy Lowry, announced that he is selling the licence for £15 million to Norwegian Telecom and 25 percent to unnamed investors who have not yet disclosed the source of their funds. Is Dermot Desmond an investor in yet another Telecom Eireann venture? The public has a right to know the identity of the investors involved. “In selling the licence, the Minister placed a cap of £15 million on the price anybody could pay. Contrary to his statements, the European Union did not require this £15 million cap. What role did Padraig O’hUiginn, former Secretary to the Taoiseach, play in the decision to impose the cap? Is he a member of the successful consortium? The public has a right to know. When the PR hype was put aside, Irish taxpayers will be aghast to discover that they are being short-changed in this deal by at least £35 million and, had free bidding been allowed — as is in any normal sale or auction — by as much as £75 million. This is the most astonishing deal ever contemplated by an Irish Minister. It is the biggest betrayal of the Irish taxpayer that I have witnessed during my time in this House, and this includes the Goodman and other beef scandals. “To put the value of this licence in context, the House should be aware that in a similar situation in Austria — another EU Member State with a population of 7 million — the mobile telephone licence fetched the Irish equivalent, in GDP terms, of IR£110 million. The actual price was £270 million. The massive loss of revenue in this case to the Irish taxpayer is only one aspect of this deal. A number of major US corporations in the telecommunications field submitted bids for this licence. They were astonished that the Irish Government gave it away for a song and are completely mystified with regard to how the situation arose. These corporations have been refused an explanation by the Minister, and no information has been forthcoming with regard to how each application was evaluated. Astonishingly, the Minister announced the award of the licence to Esat four to five weeks ahead of the publicly stated date for such an announcement. Why was this done? Why did the full Cabinet not get papers in good time to allow for full discussion and subsequent decision? What stroke was being pulled by the Minister and for what reason? How could a Minister in his position deal in such a cavalier fashion with such an important source of massive revenue to the State? Taxpayers have good reasons to be angry. They have been done out of tens of millions of pounds and have never been told how or why this was done. The other companies which tendered are angry. “My information is that there is a view among US businessmen that this affair would have been handled better in a banana republic and that they would think twice before they or those they influence would consider investing in this economy in future. The Minister and the Taoiseach know that there have already been adverse effects, and in one case a potential investment which would have created 400 jobs in the southern region was transferred to another country because of our Mickey Mouse carry-on over this licence. “MR. LOWRY: The Deputy is exaggerating. “MR. MOLLOY: I do not exaggerate. This afternoon, Mr. Dennis Sandberg of the US Embassy wrote to Mr. Loughrey, Secretary of the Department, protesting on behalf of AT&T, Southwestern Bell, Comcast and Motorola and at the nondisclosure of the evaluation process and the lack of justification for a cap of £15 million. This affair is a scandal and needs to be explained or exposed. “MRS. O’ROURKE: My party demands full disclosure of all the facts pertaining to the award of this reasons. We are embarked on the new adventure of the break-up of monopolies and it is important domestically and for our reputation in Europe and throughout the world that this business is carried out in an open, transparent and accountable way for those who were awarded the licence and for those who were not. We must ensure that the miasma is cleared and the questions which need to be answered are done so openly. Any necessary disclosure should be made quickly and instantly. The understandable disquiet which has been expressed publicly and in the media must be cleared once and for all. It is not good enough that the Minister changes the agenda, the criteria and the facts which need to be addressed. My party wishes to see the matter cleared up forthwith. “MR. LOWRY: The GSM licence is a milestone document, and it is of critical importance that it be well drafted. The only — and I emphasise the word “only” — reason for delay in issuing the licence is the time needed to draft this complex document correctly. While an indicative draft was available at the time of the competition, it could only be finalised and put into legal form as soon as a decision was made. Much of its detailed content is based on the winning tender. I am determined that the licence be issued as soon as possible. We must not make haste at the expense of accuracy. The content of the licence is agreed between my Department and Esat Digifone, and it is now with the Attorney General’s Office for legal clearance. “In circumstances where there were six professional costly and competitive applications, it is entirely understandable that there are disappointed applicants; there was only one prize. That this disappointment should manifest itself in the type of innuendo and comments we have heard from Deputy Molloy is entirely unacceptable. I want to emphasise, one more time, that the selection process was thoroughly carried out by a team of officials and consultants without interference of any kind from me or anybody else. They carried out their evaluation by reference to the selection criteria which were well-known to all applicants in advance, and they specifically respected the priority order indicated. The departmental team and the international independent consultants separately and collectively recommended one winner, and the Government approved that result. “MR. LOWRY: The separate question of whether to give feedback in relation to their applications to individual applicants has been under consideration for some time. The format of such feedback, whether oral or written, is being considered and the details of this approach are being settled in discussions with the consultants and the Attorney General’s Office. There is no question of comparative feedback with the winning applicant or with other applications; the confidentiality rules would not allow it. Please remember that somebody came last as well as first, and they may not wish that fact to be trumpeted. Within that constraint, the intention is to be reasonably forthcoming. “There have been formal requests from a number of applicants, informal approaches by the US Embassy and some contact by the IDA on the matter. This country enjoys a high reputation among US corporations for probity and honesty in its business dealings with them. I cannot imagine that failure to win a single licence in a clean competitive process would damage that reputation. “MR. LAWLOR: The Minister should not bet on that. “MR. LOWRY: The Deputy would not know a lot about that. He is the master of that art. “MR. MOLLOY: The affair stinks to high heaven. “MR. LOWRY: I am anxious to facilitate requests for information but can only do so within the legal constraints of the competition. “MR. LAWLOR: The Minister should answer the question. “MR. LOWRY: What I most definitely cannot do is change the result of the competition, which was open and fair. Equal opportunity was afforded to all participants under the established and agreed procedure. “MR. MOLLOY: The Minister even reneged on a commitment to the US Embassy. And that ended that particular debate. Now, the matter arose in the Dail again on the 30th April of 1996. The reason that I am opening this is I made reference to it yesterday and it relates to an inquiry which the Tribunal will be making, but again the text appears to show, from the information available to the Tribunal, an informed debate and particularly informed perhaps on the then opposition side. MR. LOWRY: “I have made several statements in this case and elsewhere about the competition for the GSM licence and answered questions in the house on a number of occasions. I’ll skip down to where Mr. Lowry makes his statement. “MR. LOWRY: Competition can only succeed where the playing field is level. We have already seen major reductions in handset costs, and I want to see call prices drop too. “The question of confidentiality needs to be fully understood because it is relevant to various aspects of the matter. The way the competition was structured gave interested parties who had paid a deposit of £5,000 an opportunity in the first four weeks to ask questions in writing about the process. It was agreed at the outset that these questions would be addressed in a memorandum to all competitors a couple of weeks later. “Nine parties posed written questions. Of these, four who eventually became applicants raised the subject of confidentiality of information supplied in applications. It was clear that confidentiality was an important issue for interested parties. Indeed, it is somewhat ironic that Persona, which has been the most vociferous in relation to disclosure, was one of the consortia which originally sought a commitment of confidentiality. Failure to respond adequately to these questions on confidentiality carried the serious risk of frightening away consortia anxious to secure the licence. “This was not a clever device intended by me or my Department before or after the event as a block on transparency. It came, as I said, by way of widespread concern by potential applicants before submitting applications and a considered response from those managing the competition. It is understandable why confidentiality was necessary. Any competent application was certain to contain enormous detail on business strategy, marketing philosophy, pricing proposals, company ownership, financial standing etc. Deputies can get some idea of the sheer volume of the information when I tell the House that the applications ran to 350 pages plus appendices and supporting documentation. “I also want to make it clear that I have a duty to protect the confidentiality of the strategy of Esat Digifone. To make such information available to Eircell would undermine the impact of the entry of the second operator to the market and run directly counter to the spirit of my intention to create a competitive market based on a level playing field. “There is a second angle to this which I want to mention briefly. Comparative bidding procedures for mobile licences did not start and finish in Ireland. Such procedures are now common worldwide. Many of the members of the consortia which applied in Ireland will be competing against each other elsewhere. If a Minister in any country was considering the outcome of a similar competition and he or she was aware that the apparently successful applicant had come last out of six in a recent competition in another country and that this was public knowledge, what would he or she think? That angle alone would have to give disappointed applicants cause for reflection. I am not saying this in any menacing way. I am just stating the obvious. “Putting together a detailed application for a mobile licence is an expensive business. The total cost of the six applications which we received was probably in the region of 10 to 15 million pounds. This is a large sum of money leading to a lot of disappointment, but it was always known that there could be only one winner. The disappointment is understandable, but the way it manifests itself in terms of innuendo is a problem. This is something that the interested parties, and I do not exclude certain sections of the media, need to reflect on. How long will they keep this campaign going? What do they expect to gain? I again emphasise that I fully uphold the conduct and integrity of the public officials and the consultants who conducted this exercise. “I now propose to recite at some length the history of the GSM competition. The Department of Transport, Energy and Communications has been working seriously on a GSM competition since late 1993. The preparatory phase included an “open door” consultation process with interested parties. This, to a large extent, was a learning phase for the Department where various options in relation to the process as a whole were canvassed with consultants and interested parties. London-based consultants had a limited low-cost input into the design phase of the competition in 1994. My predecessor as Minister will know all about this initial preparatory phase of the competition. “It fell to me as a newly appointed Minister to move the process forward. The style of the competition and the rules which applied were approved by the Government and made known following the announcement of the competition to all interested parties. All parties accepted the rules. This is important because it shows that it was the Government who set out the rules for the competition; the parameters are a political matter. Once that decision was taken and announced by me on the 2 March 1995, the conduct of the operation of the competition within these parameters was carried out by the Civil Service, in other words, officials of my Department and the Department of Finance, with the aid of consultants. “In view of the controversy which followed, I want to remind the House of this starting position with which I have been consistent ever since. At an early stage I became acutely aware that rumours were circulating within the industry that the outcome of the competition was a foregone conclusion. I have no idea whether this was true, but I and my officials moved to assure all interested parties that it would be a clean and open competition. “We set out at the beginning clear selection criteria which were fully known to all parties. Applications had to pass the first hurdle of demonstrated financial and technical capability. The criteria, which were clearly stated to be in descending order of priority, were as follows: Credibility of business plan and approach to market development; quality and viability of technical approach; approach to tariffing, which had to be competitive; and the licence fee. There followed a series of lower priority criteria, notably, timetable for achieving roll-out of the system; international roaming plans; performance guarantees and spectrum efficiency. “I have now made the full list of eight selection criteria publicly available, together with the weighting formula used. This clearly reflects the fact that the market development, technical quality, call charges and monthly rentals were the principal deciding factors. “I will deal fully with the licence fee in due course, but I want to make it absolutely clear at this point that the fee never ranked higher than fourth in the order of priority in the selection criteria. The weightings fully reflected the descending priority order and are consistent with everything which went before. “I want to remind Deputies also that all the rhetoric is based on a few countries who charged high fees. The fact that the majority of European countries charged no fees or minor fees is constantly ignored. As far as we can establish, countries that charged no fees or insignificant administrative fees include Denmark, Finland, France, Germany, Norway, Netherlands, Portugal, Sweden and the United Kingdom. “It is clear from the outset that the process of evaluation of the applications would be complex, would require specialist expertise and would have to be carried out to a high degree of objectivity. An international competition was held to recruit appropriate consultancy advice. The contract was awarded to a Danish firm, Andersen Management International. Andersens had substantial relevant expertise in similar processes in Europe and demonstrated in its tender a highly developed approach to evaluation. “When I announced the competition for the second GSM licence I was determined to put in place a selection process that would be fair, impartial and objective. An evaluation team led by my Department was set up which included the consultants and officials from my Department and the Department of Finance. This team was given responsibility for the conduct of the entire process and to make a recommendation regarding the award of the licence. The group incorporated special technical and financial and management expertise from the Civil Service as well as the expertise from the consultants. “It was also recognised that the interested parties would require clarification of some aspects of the original tender documentation and to raise questions. Parties were allowed to pose questions both to the Department and Telecom Eireann which would be responded to in a composite memorandum issued to all interested parties. This was the same memorandum in which the confidentiality aspect was dealt with. “The Department and Telecom Eireann issued the memorandum on the 28 April. The Department followed up with a further memorandum on the 12 May with further points of clarification, guidance on assumptions for the preparation of applications and an initial draft of the licence. This information process was designed to ensure to the maximum extent possible the success of the competition would not be undermined by any needless efficiency of information, and to ensure absolute uniformity in the information available to all of the interested parties. “On this latter point, I would like to emphasise that following the launch of the competition the Chairman of the project team set out ground rules for contacts with interested parties which would ensure that no consortium would gain any advantage in terms of information. “The competition document was made available to the European Commission as soon as it was announced. The original tender document envisaged that applicants would declare the amount that they were prepared to pay for the licence but that Eircell would not pay any fee. The closing date for receipt of applications was originally set at the 23 June 1995. However, on the 3 May, I received a letter from Commissioner van Miert, dated 27 April, wherein the Commissioner raised questions and in particular objected to the auction element of the licence fee. “The Commission’s difficulty with the fee requirement was based on a legal argument stemming from the competition rules of the Treaty. The Commission considered that a high fee paid by the second GSM operator and not by Eircell would contravene the competition rules of the Treaty unless there were other compensatory measures. It was decided quickly that it was far too risky in terms of legal and financial exposure to complete the competition with the possibility of Commission action after the event. Imagine what would have happened and what Deputies would say if we had announced a winner, issued the licence and then had to change the ground rules, scrap the competition or pay out heavy compensation. Representatives of the project team and consultants had detailed discussions with the Commission on the 2 June 1995 and explored ways of relaunching the competition on an agreed basis. “It is reasonable to speculate that we could have opted for a high-fee approach and levied the same fee or something close to it on Eircell. This solution is being followed in some cases, although the Belgians have still not settled the fee for Belgacom and the company is threatening litigation against the Government and the EU. We opted for a moderate approach to the fee. It was of course consistent with my starting position. I was simply not prepared to impose a high tax on mobile phone users, and I make no apology for protecting the interests of the consumer. “‘In view of these circumstances and assuming these measures are effectively implemented, the Commission deems that the granting procedure followed by the Irish Government does not favour the extension of the current dominant position of its public telecommunications organisation, Bord Telecom Eireann, to the new GSM market, which would constitute an infringement to the Treaty competition rules. “I am told the jargon for this is ‘negative clearance’. It could not, however, be any clearer that the Commission agreed to the revised fee structure which I proposed. The Commissioner’s letter also contained a series of other conditions which have now been complied with. “When it was clear that the discussions with the Commission could not be finalised and taken on board by applicants ahead of the original closing date, my Department wrote on the 16 June to interested parties postponing the closing date. “There were no surprises in the Commissioner’s letter of the 14 July, and we were able to relaunch the competition by letter on that date and set out the revised rules to all participants with a new closing date of 4 August. I want to state also that between 14 July and the closing date, no interested party raised the slightest objection against the new fee basis and the cap on the licence fee. “Six applications were received by the closing date, and details of the applications and consortia members have already been well publicised. The fact that six applications were received was, in my view, an endorsement of the success of the first phase of the process and of the market confidence in the approach which had been taken. All six applications were from consortia which demonstrated the necessary financial and technical capability. In the event, each applicant proposed the maximum fee of £15 million and therefore, it did not impact on the comparative analysis. “As I stated, each application contained an immense amount of detailed information in regard to financial, technical and business development matters. All this material was examined exhaustively by the evaluation team, which worked intensively over a period of more than two months after the closing date. “I would like to dwell for a moment on the requirement that the applicants provide full ownership details. The ownership structure of all the applicant consortia was examined by the project team. Four others along with Esat Digifone envisaged that the project would be financed, apart from debt financing, through equity participation going beyond the original consortia members. This wider equity participation involved unidentified stakeholders arising either through private placement or through a stock market flotation. The consultants and the project team saw nothing exceptional in this for a project of this size. Andersens had clearly been down this road before. It is impossible to accept that something envisaged by five of the six applicants in some way damaged their applications. “These equity arrangements were not considered, and rightly so, to be a negative factor in relation to any application. Indeed, if the evaluation process had marked down any application on these grounds, it would be impossible to defend, and I have already made it clear that this process can be fully defended. “In the case of Esat Digifone, the intention of the consortium partners to arrange a private placement with blue-chip institutional investors was disclosed. Letters of commitment from the investors for specified amounts were submitted. In addition, strong expressions of interest in loan and equity participation in the Consortium were available from other leading international institutions. Because of the confidentiality constraints I cannot name any of the institutions concerned. The situation would be no different if any consortium had won. The project team established that all of the consortia were capable of funding the project. “The evaluation process is fully documented in the consultants’ report. This report was approved by the project team which came unanimously to a single result based on the analysis. The following is clear from the report. The evaluators, including the consultants and the relevant officials, settled their approach to the evaluation, including the weighting to be applied to the criteria, in considerable detail well in advance of the closing date; the applications were examined meticulously by appropriate groups of people from the consultants and the home-based project team – for example, technical aspects were examined by technical people and financial aspects by accountants, etc. ; the tariff aspects were examined in a number of ways and with great care to take into account important aspects such as billing principles, discounts etc. ; the selection criteria were broken down into a series of detailed indicators against which the applications could be compared; all relevant aspects of the applications were graded by different groups and the results were then tabulated in various ways with a view to identifying a winner; the applications were carefully checked for internal consistency; the consultants and subsequently the full project team came to a single result which was the one I announced and which fully respected the priority order of the selection criteria and the weighting formula agreed in advance; it is clear that the applicants were treated in an even-handed manner throughout the competition; they all got exactly the same information and equal opportunity to communicate with the evaluators. “I can categorically state that the consultants’ report is meticulous and was carried out in total good faith by the people concerned. In the course of the evaluation, and in accordance with the evaluation plan, each applicant was given a series of written questions for clarification of their bid on 24 August for reply by 4 September. Consortia were also each given three-hour meetings with the entire project team which were conducted to a preset pattern and held consecutively between 11 and 14 September. Each meeting took the form of a one-hour presentation, one hour to respond to standard questions posed to all applicants and the final hour for a general discussion to the particular application. “The question has arisen as to whether the Esat Digifone tariffs were the lowest among the applicants. The tariffs analysis in the consultant’s report is very thorough in this area. All the applicants had different approaches to segmentation of the market and a variety of pricing packages and different metering and billing principles. Their evaluation is quite complex. Confidentiality is a specific constraint in this area. I can say at this stage, however, that the application with the lowest tariffs was demonstrably weak in respect of other major selection criteria. “The evaluation did not take into account features which were extraneous to the competition. If it did, there would certainly be serious questions about its objectivity and its compliance with the rules. Jobs were not and could not be an issue. Regional location or endowments to universities, for instance, would not be taken into account. I have to keep repeating that the evaluation was carried out in accordance with the rules known in advance and nothing else. “I did not interfere with the evaluation in any way. Neither did any member of the Government. I wish to make it clear that the project team or the consultants were not influenced by any non-telecommunications factors. The consultants are specialists in advising in competitions of this kind, with a high reputation to protect. “Following the finalisation of the consultants’ report, I discussed the outcome with the leaders of the Government parties and the Minister for Finance. The selection of Esat Digifone for the award of the licence was agreed on the 25 October, and I announced the result that evening. “In a case as sensitive as this there is great advantage in announcing the result as soon as possible to put an end to speculation which grows around such matters, as was the case on this occasion. There was no undue haste. The plan drawn up by the consultants in July shows clearly that the final report was to be submitted in the week beginning 22 October. The consultants are to be congratulated for achieving this target. My commitment was to announce the result not later than the end of November. If I had not allowed some interval in case of slippage, I would have been open to criticism for not meeting my deadline. “No political or other extraneous considerations entered into the selection, which was made totally on the basis of objective criteria laid down in advance and made known to all. Esat Digifone won the licence because the project team determined, after meticulous comparative evaluation, that it had submitted the best application. “‘We have followed the GSM evaluation process in Denmark, Holland, Germany, Norway, Spain, Italy, Sweden and France. We only know of one country, France, which has published parts of the evaluation documents. In the case of France, two aspects should be mentioned. First, the ministerial evaluation report was modified for the public audience before it was released. Second, prior consent was given by the bidders. “To our knowledge, the evaluation reports used in the above-mentioned countries – except for France – were kept secret in order to protect the bidders, who had provided the Government with information under the belief that it would be treated confidentially. “I am aware that the Austrian Government has a constitutional obligation to justify its decisions. I also note that disclosure is less relevant in cases where the size of the cheque determined the result. “I explained the confidentiality constraints at the beginning of this statement. I would like to be as helpful as possible to understandably disappointed applicants, but the constraints on me are severe. It is therefore proposed that individual briefing sessions will be held with the unsuccessful applicants where each will be given an outline of the evaluation process and the assessment of their own application. “MR. MOLLOY: The Minister should have done that months ago. “MR. FINUCANE: We will deal with the Deputy later. “AN CEANN COMHAIRLE: Let us hear the Minister without any further interruptions. “MR. OWEN: We will give the Deputy a call later. “MR. LOWRY: It will not be possible to provide any comparative details on the winning or any application. “I have already spoken about jobs, but I now want to turn to specific suggestions as regards the loss of jobs in Ireland because of the GSM decision and in particular, the reported loss of Motorola jobs in Cork. Procurement by the second GSM operator will be determined fully within the terms of the European Union procurement rules, which require that major contracts of this kind must be put to open tender. Motorola, or any other equipment supplier, will have an equivalent chance of winning any such contract, regardless of the membership of the successful consortium. I reject, therefore, the speculation that jobs might have been lost because the Consortium of which Motorola was a member was unsuccessful in its bid for the GSM licence. “I am aware that the Persona consortium has announced its intention to lodge a complaint with the European Commission in relation to the GSM process. I have no problem with that. The bottom line is that I am convinced that the process and the decision will stand up to any scrutiny. I have no problem with an examination by a third party. I welcome it if it puts an end, as I am sure it will, to the damaging questioning of a fair competition. I read in one newspaper that the first line of complaint was to be about my failure to charge a high-enough fee. In the context of what I have already said to date, there are no marks for guessing what the Commission would do with that. “The GSM licence is a milestone document, and it is of critical importance that it is comprehensively and accurately drafted. Much of its detailed content is based on the winning tender. The substance of the licence has been agreed between my Department and Esat Digifone and it has been, in recent days, the subject of final legal clearance. I expect this clearance will be forthcoming shortly. This is somewhat behind our original schedule, but I stress that the only reason for delay is due to the time needed to draft the highly complex document. “Those are the facts. It is clear that every aspect of this historic competition has been carried out in an exemplary manner – whether by me, the officials in my and other departments, or in the international consultants. I think there then are a number of exchanges which do not appear to have huge relevance, although I just refer to them. Now, if we go to the bottom of page 9, there is a question from Mr. S. Brennan. “MR. S. BRENNAN: Did the Minister decide on the figure of 15 million, yes or no? “MRS. O’ROURKE: Who decided on the figure of 15 million? “AN LEAS-CEANN COMHAIRLE: Let us hear the reply. “MR. S. BRENNAN: I asked a straight question. Was the Minister the first to suggest £15 million? “MR. LOWRY: The Commission objected to the auction fee. At my request my officials went to the Commission and had consultations and discussions with them and agreed a joint approach. The joint approach was to cap the fee at £15 million and for a £10 million fee to be levied on Eircell. We put those terms and conditions in writing to Commissioner van Miert, and he responded as I have stated, by giving clearance for the proposal by the Irish Government. “MRS. O’ROURKE: The Minister’s officials said he had no hand, act or part in it. “AN LEAS CEANN-COMHAIRLE: Please let us hear the Minister’s reply. “MR. LOWRY: He responded by giving clearance for the proposal by the Department and said it was in compliance with competition rules and the Treaty rules. “MR. BRENNAN: This is the core of the matter. Will the Minister confirm, which he has virtually done, that the proposal that the figure of £15 million and not £50 million came from him? “MR. LOWRY: I have clearly outlined the procedure. We had intended initially that there should be consideration of the auction principle. This principle was castigated by Deputy Brennan at one stage, but later Deputy Noel Treacy and Deputy Sean Doherty said we should have gone to an auction. There was an immediate contradiction in the Fianna Fail position. The Government’s position was clear. We sent our proposals to the Commission. “MR. S. BRENNAN: Who proposed £15 million? “MR. LOWRY: The Commission objected to the auction element. We then entered into consultation with the Commission to get an agreed approach. It was agreed at the consultation and in writing that we should proceed along the lines of £15 million for the incoming operator and £10 million for the incumbent, which was Eircell. “MR. MOLLOY: Does the Minister agree that much of the disquiet over the granting of the mobile telephone licence arose from the Minister’s refusal to say why the unsuccessful applicants were not successful? Several months after announcing the successful bidder he announced today, when this debate was forced on him, whether he is prepared to give individual briefings to the unsuccessful applicants. If he had done that initially, much of the public disquiet, media comment and questioning in this House would not have been necessary. Opposition members have a duty to ask questions on behalf of the public, and this matter involves taxpayers’ money. “Having decided not to accept the highest-bid principle for this licence, should the Minister not have chosen the bid that would have given the lowest tariffs so the consumers might benefit? The Minister neither accepted the highest bid, which would have benefited the Exchequer, nor the low tariff, which would have benefited the consumer. Who will benefit? Will it be the Norwegian Government, a major part of the consortium? Does the Minister not see the contradiction in his method of choosing the successful bidder? “MR. D. AHERN: Is the Minister talking about being responsible? “MR. LOWRY: – in the manner which he puts those questions so that he is not scaremongering or damaging the reputation of civil servants or consultants of an Irish Government. “MR. MOLLOY: I have the right to ask questions. “MRS. DOYLE: The Deputy should listen. “MR. MOLLOY: I have listened for the past 50 minutes. “MR. LOWRY: When I set out to provide a licence for the second mobile operator I had one objective in mind namely, to ensure that by way of competition we would reduce the price of telephone hardware, reduce call charges for Mobile Operators and ensure real competition in the market. If I had done what the Deputy proposed when he told me outside the House that I was selling off the family silver to shore up public finances, we would not have the lower prices on telephone hardware or lower tariff charges. The Deputy is arguing again the philosophy of the Progressive Democrats party. “MR. S. BRENNAN: It is obvious from what the Minister said that on the 22 June he wrote to Commissioner van Miert and proposed a figure of £15 million. He could have proposed £50 million, but he chose £15 million. The Minister stated that letters were submitted and names given, in other words he got the information he sought about who owned shares in the company, but the names were not disclosed on the 22 November. “MR. LOWRY: Nor will they be. “MR. S. BRENNAN: Why were names not disclosed on 22 November” – that’s a reference to the question time in the Dail on that day – “when letters were submitted before the Minister made the award? Did he know who owned the 20 percent before awarding the licence? Did he mislead the Dail in this issue? Will he tell the House who are the beneficial owners of the remaining 20 percent of the winning consortium? Then I’ll go down to “Mr. Lowry”. “MR. LOWRY: Deputy Brennan’s comments are negative and destructive. The Communicorp funding requirement was underwritten by a party acceptable to my Department. The intention of the consortium partners to arrange a private placement by what can only be described as blue chip institutional investors was disclosed by them to my Department. Stockbrokers were named and letters of commitment for specified amounts from the investors were submitted. In addition, strong expressions of interest in loan and equity participation in the consortium were available from other leading international financial institutions. This was the position when the decision was made. “MR. S. BRENNAN: The Minister is not telling us who the consortia were. “MR. FINUCAN: The Deputy should read the Minister’s script. “MR. S. BRENNAN: Who owns the 20 percent? “MR. LOWRY: I reiterate that there was nothing unusual about the Esat Digifone application in this area compared with most of the other applicants. We are talking about an up-front capital investment of approximately £120 million. It is understandable that any business of that size would be financed by debt and equity, and the normal ratio is 50:50. That is precisely what happened in this case. “MR. D AHERN: Someone must own it. “MR. LOWRY: That is how at least five of the bidders proposed to fund it. “MR. S. BRENNAN: Who owns it? “MR. B. AHERN: The man on the moon. “MR. LOWRY: The principal function of my Department was to ensure that each of the six companies who sought the licence had the capability and necessary funds in place to fund the project. We satisfied ourselves in that regard. “MR. S. BRENNAN: The Minister does not have the right to sign confidential agreements on behalf of the State. He can not sell the State assets confidentially. “MRS. GEOGHEGAN QUINN: Who owns it? “MR. BRENNAN: The Minister should not have sold it. Mr. Lowry continues: “The company concerned is the only source from which information on the beneficial owners of the licence can emanate. We are granting the licence to Esat Digifone, and before it is issued I will request the company to put on public record the composition of the consortium and from where the funding came. Then there are a number of exchanges which I don’t think I need make reference to at the moment. “MR. MOLLOY: The Minister said that the weighting was decided up front. Was there a change in the weighting after the cap was imposed? If all the consortia were deemed to be capable of funding the project, why have funds not been forthcoming? Will the full ownership of the licence be disclosed before the Minister signs the licence? “MR. LOWRY: As has been clearly stated in public on a number of occasions and confirmed by way of statement by the company involved, Esat Digifone, the funds have been in place for a considerable period of time. “MR. MOLLOY: Does the Minister accept that, and is he happy? “MR. LOWRY: “That information should also be passed on to Deputy O’Malley. The ownership of the company is a matter for Esat Digifone. Before the licence is signed, it will make full disclosure in respect of how it has put the funding in place, the ownership of the company and the stakeholders. “MR. D. AHERN: It is up to the Minister to dictate the terms. “MR. BRENNAN: “The Minister will not tell us to whom he sold it. “MR. LOWRY: Five of the consortia decided that in one form or another, whether by placement, flotation or an input by a financial institution, we are placing 20 percent aside for that particular purpose. “MR. D. AHERN: It is the Minister’s duty to know. I then go to Mr. O’Keeffe. And in the first portion, I’ll just continue down in his intervention. “Given the Taoiseach’s espousal of openness and transparency and the fact that this was the sale of a public asset, why did he not insist that matters pertaining to ownership would be in the public view? Will the Minister accept that perhaps it was a mistake, given that we now have press speculation that 20% could be owned by such people as Mr. Desmond and others? The confidentiality has now led to speculation throughout the press. Will the Minister make public the full ownership of Esat Digifone before the licence is signed? “MR. HOGAN: He said that. And those are the portions of the particular Dail references to the GSM project between the time of the announcement of the evaluation competition and the issuing of the licence, which took place on the 16th May, 1996. Now, an opinion was furnished by counsel through the Office of the Attorney General, which addressed the question of change of ownership after the issue of the licence. The specific issue of changes in the ownership of the consortium between the date of the application and the date of the issue of the licence does not appear to have been further pursued by the Department. It appears that the Department continued to be concerned about the ownership issue in May of 1996. I refer to your letter dated 17 April 1996 concerning the restructuring of certain ownership interests in Esat Digifone. The application also provided details of the ownership of the operational partners and identified the probable institutional investors and the broker who would be responsible for placement of equity with institutional investors. In the case of Communicorp, it was indicated that it was 66% owned by an Irish investor (Mr. Denis O’Brien) and 34% by Advent International. – Full details of the ownership and categories of all shares of Esat Telecommunications Holdings Limited including in particular by persons other than the owners of Communicorp. It is essential that the Department can identify precisely any change in the effective ownership (both direct and indirect) of Esat Digifone since the time of submission of the application. Finally, it would be appreciated if you could confirm that full certification of the following matters will be provided before the award of the licence. It is essential that these matters are cleared up before the issue of the licence. We also need to discuss the public presentation of these matters. I am available for any discussion you may require of the foregoing. The extent of the Department’s concerns is apparent from a note made by Mr. Owen O’Connell of a meeting at the Department on the 3rd May 1996. Now, it has been reconstituted, so I’ll just put it up. It’s to file; it’s from OO’C. Client: Esat Digifone. Matter: Licence negotiations. And it seems to record as present: KD, Knut Digerud; POD, Peter O’Donoghue; AJ, Arve Johansen; MW, Michael Walsh; P. Connolly; Owen O’Connell at Department of Communications; Martin Brennan; Fintan Towey; Regina Finn; and then there is Eanna – that may be a reference to a Mr. Eanna O Chongaile. Esat Digifone changes relative to bid. Change in institutional investment – replacement of Advent and Davys by IIU. Confirmation that Telenor is same as at bid date. Differences (in detail) as to expertise and asset strength between Communicorp and Esat Telecom Holdings. Telenor “backdrop” statement as operator – as last resort. AJ – that’s the way we see it, anyway. “We’ll never abandon this one”. Not requesting statement, but would be helpful per MB. Project finance – POD – bank 60/equity 40. ABN plus AIB appointed co-providers £25 million bridging committed. Thought to presentation. More the better provided agreed in advance. Donal Buggy plus Billy Riordan, maybe Andersen. There is no note or record of this meeting in the Department documents. The Department did not inform the Tribunal of this meeting. The Tribunal only became aware of this meeting from the contents of the memorandum which I have already mentioned, which Mr. Arve Johansen made, dated 4th May, 1996, in Oslo. Now, I have opened portions of this at various stages, but I think it might be more appropriate now, at this stage, to open the whole of Mr. Johansen’s memorandum. “Re memo on shareholding in Esat Digifone. “I have below summarised a few points that has become clear to me over the last 24 hours as a consequence of the information acquired regarding Communicorp’s attempt to buy back 12.5% of the IIU shares. “1. Denis O’Brien came personally over to see me in Oslo probably sometime during September last year. He informed me that, based on information from various very important sources, it was necessary to strengthen the Irish profile of the bid and get on board people who would take a much more active role in fighting for Digifone than the ‘neutral’ banks who basically would like to keep a good relation to all consortia. “I accepted Denis’ word for necessity for this new move. (Note: Underwriting was never used as an explanation). “2. IIU should apparently be the ideal choice for this function; the only string attached being that they had demanded a 30% equity participation “for the job”. Denis had managed to reduce this to 25%, but it was absolutely impossible to move them further down. This was a disappointment to us, since everything we had said and done up to then had been focused on at least 40% ownership for the principal shareholders at the time of the issuing of the licence. But not only that, Denis then pushed very hard for Telenor to swallow 15% of this and Communicorp only 10% – to which I never agreed – but I accepted the principle of sharing the pain and maintaining equal partnership (37.5%/37.5%). It was also said that a too-high Telenor ownership stake would be seen as aggressive and could be inhibiting the award of a licence. “This is the first time I experienced real hard and very unpleasant push from Denis. “3. Some days later the nature of the agreement with IIU comes clearer into the light, as an underwriting agreement to guarantee for Communicorp’s timely payment of its share of the capital into Digifone, and including the right to place the shares with up to four nominees. This was unwillingly accepted by Telenor (since we understood it be to be the right steps to be taken from an “Official Irish standpoint” to secure the licence). “The agreement was drafted by Frys/OO’C and signed in a hurry (basically in draft form) by Denis O’Brien alone on behalf of Communicorp and Digifone (even though we in the JV agreement have made it clear that two authorised signatures are required – one from each party). “4. The agreement was never signed by Telenor, either as authorised Digifone signature nor as a shareholder and a party to the agreement. Sometime shortly after this, the Advent commitment to invest $30 million into Communicorp disappears as it was essentially not necessary any more since the Communicorp liability to pay capital to Digifone was anyway underwritten by IIU. “5. In hindsight, it is quite clear who benefited from this arrangement. I have good reason to believe that the terms put forward by Advent for investing into Communicorp did not suit Denis O’Brien. With the above arrangement that he orchestrated for all other sorts of reasons, he has actually achieved to bolster his/Communicorp’s balance sheet and paid for it with Digifone shares at the cost of Telenor. He has done this in an atmosphere of trust where Telenor even has agreed to bridge-finance Communicorp while he raises funds through a private placement in the US. “6. As we go along, we learn more, but it all serves to disclose more details which again more and more prove the above scenario. “In the meeting with the Department of Communications, Friday May 3rd, it became evidently clear that IIU was not a favourable name from a “Irish public” point of view. On the contrary, the Ministry basically asked for help for how to explain why we had substituted Advent, Davy Stockbrokers and other recognised named institutional investors in the bid (AIB, Investment Bank of Ireland, Standard Life Ireland). “Eventually the project coordinator from the Ministry – Mr. Martin Brennan – actually appealed (off the record) to Telenor to write a letter of comfort that we would serve as last resort for the Digifone company for funds and operational support. My feeling was that if Telenor had owned it alone, he had been more comfortable than with the current shareholders. “I think it would be a very prudent thing for Telenor to do, especially since we then effectively underwrite the whole project, both Communicorp and IIU, after already having paid Communicorp’s price for the first underwriting, which now appears to be useless. “7. But the story doesn’t end there. Two days ago I was informed by Denis that he had entered into an agreement with IIU to buy back 12.5% of the shares now held by IIU. I found it absolutely unbelievable, and made it clear that Telenor would not accept anything but equal partnership; either we buy 6.25% of the IIU-held shares each or Telenor should take the other 12.5% of the IIU-held shares. “I have also now seen the letter of agreement between Communicorp and IIU which strongly supports the scenario outlined above. – IIU apparently has no (or very little at least) money and cannot afford more than 12.5%. The price agreed is a little cryptic, but it looks as though any advances that IIU has to make for the disposed. 12.5% before the transactions effective date (31 May 1996) is seen as cost (???). It will, if this is the case, serve as a moving target for IIU’s eventual gain on the transaction putting an immense pressure on Communicorp to delay capital calls in Digifone until the US placement is finalised. – The return favour from Communicorp is to release IIU from all its underwriting obligations in Digifone. Does Digifone have an opinion on this, and what about Telenor? This effectively gives Communicorp back its 12.5% of the shares at par (or close to), releases IIU from all its underwriting liability (which Digifone “paid” 25% for), and IIU ends up having delivered absolutely nothing, having done nothing but complicated the award of the licence (if we get it at all) but with (some cash?) And 12.5% of the shares of Digifone which effectively have deprived from Telenor, at the same time as the Department – and our honoured partners – gently ask us to underwrite the whole project. Now, I want to make it clear that Mr. O’Connell’s notes of the meeting of the 3rd May was made available to the Tribunal when his documents were subsequently produced to the Tribunal voluntarily. The first indication that the Tribunal had that such a meeting had taken place came, as I have said, was when Mr. Johansen’s memorandum became available to the Tribunal. Mr. Martin Brennan has informed the Tribunal that he can not find any contemporaneous record of the meeting of the 3rd May, 1996. In the context of the documents on file, it seems clear that it was part of their checking of the financial status of the potential licencee in the lead-up to the issue of the licence. He has informed the Tribunal that he has very little recollection of the detail of this investigation and the meeting itself, which suggested to him that he probably chaired the meeting in an “ex officio” capacity, having been the Chairman of the Project Group. Mr. Fintan Towey has informed the Tribunal that he doesn’t have a specific memory of this meeting. He has informed the Tribunal that the report by Owen O’Connell would seem to be an accurate account. Ms. Regina Finn has informed the Tribunal that she notes that her name is included on the first page of Mr. Owen O’Connell’s note. She has informed the Tribunal that she has no recollection of this meeting or of being present at such a meeting. She has informed the Tribunal that if she was at such a meeting, it is likely that she would have prepared a note herself recording the portion of the meeting that was relevant to her role. And in that regard I should state that she requested the Tribunal, if we could, let her have a copy of any note which existed on the departmental files, but of course there are none. She has informed the Tribunal that it would be normal that if a senior member of the Department attended such a meeting, a Department note would have been made of the meeting. On the 7th May, 1996, Mr. Fintan Towey rang Mr. Owen O’Connell and informed him of the Minister’s strong preference that the capital configuration of Esat Digifone should be restored to 40:40:20 from 37.5:37.5:25% to accord with the capital configurations as submitted in the application on the 4th August, 1995. At this time there appeared to be a division between the members of the consortium, some of which appeared to date back to the early months of 1996, when Esat Telecom/Denis O’Brien appeared to be endeavouring to acquire a further 12.6% of the ownership of Esat Digifone. They also appear to have related to the Minister’s desire that the capital configuration of Esat Digifone be restored to 40:40:20 to accord with what was submitted in the bid. A memorandum setting out proposals by IIU to help resolve the difficulties which had arisen between the shareholders was prepared on the 9th May and appears to have been circulated to the members of the consortium. “1(a) Memorandum – this memorandum contains proposals by IIU to help to resolve the difficulties which have arisen regarding the various shareholdings in Digifone, both from the point of view of the shareholders and to ensure that the licence is granted with the minimum delay. The proposals in this memorandum are subject to detailed discussions by the parties and when agreed in principle, subject to detailed drafting. It would be intended that the proposals (subject to their being agreed) would be incorporated into the existing draft Shareholders’ Agreement and that such agreement would be appropriately amended to take account of them. For the avoidance of doubt, this memorandum is for discussion purposes only and is without prejudice to the parties’ existing situation. “(b) the existing shareholders in Esat Digifone Limited are Telenor Invest, Esat, Telecom Holdings Limited and IIU Nominees Limited. Telenor 37.5%. Esat Digifone 37.5%,  IIU 25%. “The IIU shares are ultimately beneficially owned by Dermot F. Desmond. “1. Sufficient ordinary shares at par will be issued to each of Telenor and Esat to ensure the following percentage shareholdings in Digifone as of the 13 May 1996. Telenor 40%. Esat 40%  IIU 20%. “2. Both Telenor and Esat will grant an option to IIU over 2.5% (i.e. total 5%) of the share capital of Digifone for £1 (the option shares) or alternatively IIU will be given the right at any time after the licence issues to subscribe for such amount of ordinary shares as will give it a total of 25% of the entire issued share capital. “3. IIU will contribute capital to Digifone in relation to said option shares as if IIU were the owners of same, i.e., IIU will act as if they owned 25% of the issued share capital subject to the exercise of the options described later. “4. Telenor will have a right (‘the Telenor right’)to acquire from IIU the option IIU has over 2.5% of the capital of Digifone (assuming IIU has such option) together with half of IIU’s shareholding as of the 13 May 1996 (i.e. a further 10% or 12.5% of Digifone), as the case may be. “5. The Telenor right will be exercisable at fair market value (to be defined) at any stage between the third and fifth anniversary of the execution of the Shareholders’ Agreement. “6. Esat will have a right (‘the Esat right’) to acquire from IIU the option IIU has over 2.5% of the capital of Digifone (assuming IIU holds the same) together with half of IIU’s shareholdings as of 13 May 1996 (i.e. a further 10% or 12.5% of Digifone), as the case may be. “F. An undertaking being given that irrespective of percentage shareholding controlled by Esat, Esat will have no right to vote a greater percentage of shares than that held by Telenor, or alternatively voting rights would be varied to give the same effect. “8. The parties agree that the final documentation will contain covenants by the parties to float 20% of their shares on a recognised Stock Exchange no later than the fifth anniversary of this agreement. This flotation is to be arranged by IIU on normal commercial terms. “9. The parties agree that the final documentation will contain covenants by the parties to place a minimum of 20% of the shares in Digifone at the time of flotation, such placing to be arranged by IIU, said 20% to be placed by each party pro rata to its holding. “The foregoing proposals are to be treated as heads of terms only and non-legally binding until agreed and incorporated into formal documentation.” That was the 9th May of 1996. Now, following the circulation of that memorandum, it appears that Mr. Arve Johansen wrote to Mr. Michael Walsh on the 11th May, 1996, setting out Telenor’s position regarding the proposals contained in the memorandum. “2. Enclose two draft share transfer agreements subject to which IIU would transfer 2.5 percent of its shares in Digifone each to Communicorp and to Telenor. “First we will commit on the arrangement outlined in your letter of 1 May 1996 and then comment on the draft share transfer agreements. “Communicorp and Telenor last year entered into a joint venture to bid for the second GSM licence in Ireland. Telenor believed that a joint venture between Communicorp and Telenor would be a strong contender for the second GSM licence in Ireland, Telenor being an experienced and successful mobile operator and having sufficient financial strength to commit to such a project and Communicorp representing first of all the Irish participation in the project. “Although Telenor would have preferred to have a majority participating interest, Telenor accepted that the joint venture with Communicorp was established on a 50:50 basis. This was accepted despite the fact that Communicorp did not have the financial strength to carry half of the financial commitment that was necessary to support the joint venture if it was awarded the licence. As a consequence of Communicorp’s lack of financial strength, Communicorp subsequently has invited institutional investors to participate in the project, necessitating a dilution of the existing shareholders. Communicorp has strongly argued that Telenor under the circumstances must accept a dilution of its participation despite the fact that the dilution was caused by Communicorp’s lack of financial strength. Telenor has opposed to the reduction of its participating interests below that of Communicorp. On two occasions, therefore, Communicorp and Telenor’s participating interest in Digifone has thus been reduced first to 40% and then to 37.5 percent. “The reduction of Telenor’s and Communicorp’s participating interests from 50% to 40% each followed a commitment from AIB and some other institutional investors to take a 20 percent stake in Digifone, and Advent’s commitment to invest $30 million in Communicorp. The reduction from 40% to 37.5% followed – as you will know – from the arrangement agreement entered into sometime in 1995 between IIU and Denis O’Brien. Subject to this agreement IIU also undertook to underwrite Communicorp’s financial obligations with respect to the funding of Digifone. “Communicorp now has established yet another way of financing its shares for the funding of Digifone. This financing arrangement is organised by Credit Suisse First Boston and would, as we understand from your letter of the 1 May 1996, ideally require Communicorp to have 50% in Digifone. In your letter of 1st May 1996 you state that you would be willing to sell a 12.5% share in Digifone to Communicorp, bringing Communicorp’s share in Digifone up to 50%. In return Communicorp would pay to IIU its historical costs related to said 12.5% share plus an amount equal to the subscriptions due on IIU’s remaining 12.5%. “First, Telenor wish to state that the transfer of 12.5 percent of the shares in Digifone from IIU to Communicorp would require Telenor’s express consent, which, as you will know from the copy you have received of our letter to Denis O’Brien of 10 May 1996, Telenor is not prepared to give. “Second, Telenor cannot confirm that it would continue to support the Digifone project if as a result of the event and arrangements described above Telenor would end up with a lower participating interest in Digifone than Communicorp. “However, as you will know from the copy you received of our letter to Communicorp of 10 May 1996, we have offered to Communicorp to enter into a “bridging agreement” subject to which Telenor would carry Communicorp’s financial obligations vis-a-vis Digifone during a limited time period, allowing Communicorp even more time to arrange its financing. “With respect to your proposal concerning the transfer of 2.5 percent of the shares in Digifone to both Communicorp and Telenor, we consider that your handwritten points on the front page of the draft agreement need to be inserted, and in particular the mechanism for the transfer of legal title to the shares with immediate effect from the signing of the agreements. We agree that the recital A should be expanded to refer to the exact present shareholding of IIU. The two agreements require to be made interdependent on one another and should contain the usual warranty as to the title to the shares being sold. We also require that an undertaking be provided in the Telenor agreement that no further shares or interest in shares shall be offered for sale or otherwise dealt with by IIU without those shares or interests being first offered to Telenor. Specifically, no shares or interest in shares should be offered to Communicorp or any person or entity acting in consort with Communicorp without the prior written consent of Telenor. It appears from Mr. Johansen’s memorandum of the 4th May, 1996, made in Oslo, Mr. Walsh’s or IIU’s memorandum of the 9th May 1996, and Mr. Johansen’s letter of the 11th May, 1996, that there may have been serious tensions between the members of the consortium in relation to financing issues affecting Esat Telecom, Communicorp and possibly IIU (Dermot Desmond). “Mr. Walsh came to PC office at 7pm on Saturday 11 May. We had just been to a meeting with Arve Johansen, the Telenor lawyer Rolf and Arthur Moran at Esat Digifone’s offices. “Michael Walsh gave me a copy of a letter from Telenor addressed to IIU. “He said Arve was getting more “entrenched”. “1. We would agree to buy 2.5 percent to add to our 37.5%. “2. Tell Arve that if he was not going to take up IIU’s offer of the 2.5%, we would be happy to. 3. We would be agreeable to sign the Shareholder’s Agreement on the 40-40-20 basis. “4. IIU or Dermot Desmond would give Communicorp Group Limited (or Esat Holdings) a loan of the cash required to fund our 40% or £6 million. This is the money that was necessary to pay for Esat Telecom Holdings’ portion of the licence fee which was due to be issued some days hence. “A, sell 5% each to Telenor and Communicorp so that we could increase to 45% each. “B. Insist upon Communicorp Group Limited be granted an option for a further 5% of Esat Digifone, which would bring Communicorp Group Limited’s holding to 50%. DD thought that this option would be exercisable 12 months later. This was Communicorp Group Limited to consolidate its 50% holding (as per request from CSFB) in Year 2, i.e. 1997. It’s signed the 11 May. The signature appears to be that of Mr. Denis O’Brien, and it appears to be witnessed by Mr. Paul Connolly. “1. He did not want any pieces of paper around reflecting what was discussed. “3. DOB said “He wanted to record his understanding of what was said, as DD sometimes speaks very fast, and I wanted to make sure I fully understand Dermot Desmond proposal re now and the 45:45:10 proposal with 5% option, Communicorp Group Limited. And that’s signed by Denis O’Brien. CHAIRMAN: I suppose logically the first person referred to would be Mr. O’Brien on the first line, rather than Mr. Desmond. Now, there were further discussions concerning the ways of funding the Consortium, and in particular, of funding Communicorp’s equity commitment which, at that time, it appears, Esat Telecommunications/Communicorp were unable to fund from their own resources or from third-party borrowings. And on the 12th May, 1995, Denis O’Brien wrote to Mr. Arve Johansen in a letter marked “Strictly Private and Confidential” setting out his views on matters raised by Mr. Johansen in earlier correspondence and previous meetings. “I refer to your letter dated Friday 10th May and your letter dated 11 May to Michael Walsh. “I am disturbed by the contents and inaccuracy of both these letters. Furthermore, your continuous personal comments throughout the meeting to my colleagues on Friday at the office of Matheson Ormsby Prentice, when you also questioned the integrity of Dermot Desmond, IIU, and myself was outrageous and totally unacceptable. – The IIU agreement prior to the awarding of the licence “Was a method for Denis O’Brien to get back-door control of the business”. – The IIU agreement was entered into without the knowledge of Telenor. – On a number of occasions you clearly cast dispersions (sic) on my character. Having repeated these dispersions (sic), both Leslie Buckley and Paul Connolly stated that they were not prepared to accept the personal nature and basis of your allegations. “This kind of behaviour is not acceptable to us as partners and prevents reasonable discussion and debate taking place. “May I now remind you of the sequence of events. “1. On Friday, 22 September 1995, I travelled to Oslo to meet with Sjorn Malm and yourself to discuss the GSM bid and the participation of IIU in the consortium. Per Simonsen also joined us later on in the meeting. I had received a letter dated 15 September (copy attached) from Knut Haga stating that Advent’s letter of financial support was not acceptable. IIU participation for 25% of the equity in Esat Digifone was brought about for two reasons. Firstly, it was viewed that the consortium needed more firmly committed Irish investment content as the other institutional letters from IBI, AIB, Standard Life were letters of intent and not legally binding, the other reason being that Telenor had rejected Advent’s letter of financial support. In your letter dated 2 October 1995, which I enclose, you state “In order to reassure the Ministry and give an even stronger signal to the Irish community in general, we are pleased with the plan to have another solid Irish underwriter”. It was also viewed that by having 62.5% Irish content, the bid would be greatly enhanced. Later in the same letter you state “But on the basis of the JV and draft Shareholder’s Agreement, we feel obliged and accepted a pro rata dilution to 37.5%. Any further dilution would be in conflict with the principles of our participation and the Board resolution of Telenor AS”. The Norwegian content (non-EU) was deemed to be high at 40%, particularly since Sjorn Malm and Per Simonsen told me on the 27 April 1995 that Telenor would be selling off half its interest within 12 months of Tele Denmark (from an EU member). “1. Communicorp Group did not want to reduce its holding to 37.5% as we were the lead consortium member, having spent two years on the bid; thus we wanted to maintain our 40% interest and asked for Telenor to reduce to 35% with IIU at 25%. Despite reasoned and rational argument on our side, you rejected this request. “To finish on this point, I feel it incomprehensible that you still argue that IIU have a 20% holding and that you want Communicorp to cede 5% to IIU. You also claim that Telenor never approved IIU’s participation in our consortium. This is in direct contradiction to your letter of the 2 October. In fact you told the meeting on Friday last, minutes of which have been passed to me, that “I do not accept the arrangement with IIU”. All documentation between IIU and Esat Digifone was reviewed and cleared in advance of signing by Telenor executives. Clearly you now have arrived at a situation, despite your letter of 2 October, that you disagree with both partners, Communicorp and IIU. “IIU hosted an Esat Digifone shareholders breakfast meeting on 9 February. At this meeting I formally asked both Telenor and IIU whether you would be interested in selling Communicorp’s 12.5%, as our investment advisers in New York, Credit Suisse First Boston, had advised us that US investors would want us to consolidate our holding in Esat Digifone. Initially we thought we would need 12.6% in order to consolidate our holding for accounting reasons, but subsequently we were informed by KPMG that only 50% was required. We informed IIU of this. Subsequently Telenor wrote to us to say that they were not interested in selling any shares. On the 27 February we wrote to Knut Digerud to say that they were pursuing a deal with IIU to purchase 12.5% from them. At all stages we were frank about our pressing need to purchase 12.5% in order to complete our US placing. Richard O’Toole, representing Communicorp, had also been open with Knut Haga during the detailed Shareholders Agreement negotiations. In fact, we did not ask for any changes in the Shareholders Agreement to reflect a 50% shareholding. We negotiated in good faith on the basis of equality, with no one partner dominating another. We wanted the Shareholders Agreement to reflect this basic principle and pushed for this outcome. “At 7.30pm I received a conference call from Scott Seaton, managing director of CSFB, and his colleague who is in charge of our placing, Sean Twomey. They told me that you contacted them to ask about the Communicorp placing and whether we needed to consolidate our 50% shareholding in Esat Digifone. They asked whether I had given you permission to talk to them directly about the placing. I told them absolutely no. “Arve, you interfered without permission by calling my company’s investment bank, CSFB, to seek information regarding our forthcoming placement. You had absolutely no right nor did you receive my consent to do this. CHAIRMAN: Well, it’s probably right that we break now, Mr. Coughlan, with a reasonable amount of data still to be covered, but not, I think, if at all possible, sufficient to take this aspect into tomorrow, we might marginally abridge the lunch hour and resume at five past two.